Children scramble to collect the most eggs. 1. Print out the game patterns onto card stock and tape them together to make the game board. 2. Print out the egg patterns onto different colors of card stock or use white card stock and color the eggs. Cut out the eggs. 1. Print your child's vocabulary words or words he is learning to read on the eggs. You can also use math facts, review questions from your lessons, and spelling words. If you are using spelling words, turn the cards over so that your child cannot see the words. 2. Place the eggs on top of the pictures of the eggs on the board. You can place more than one egg on each picture. 1. To start players place their markers on top of any of the eggs on the board. 2. Each player should throw the die to see who has the highest number. The player with the highest number goes first. 3. The first player throws the die and moves that many spaces in either direction (clockwise or counter clockwise). If there is an egg or more than one egg on the space he lands on, he gets to collect one egg after saying the vocabulary word, answering the math fact, or spelling the word correctly. If a player does not answer correctly, he does not get to keep the egg. Keep playing like this until all the eggs on the board have been collected. The child with the most eggs wins. This is a fun and challenging game that reinforces the fact that two words put together can make completely new words. 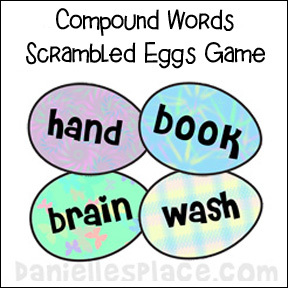 Unscramble the Eggs to Make Compound Words! How to Make Scrambled Eggs Game: Cut egg shapes from the paper and write words on the eggs that when put together will make a new compound word. To Play: Give each child a set of cards and see who can "unscramble" the eggs first. Three different sets of nine compound words and a Fill-in-the-words sheet are Available to Members. This pattern is also available as an instant download for $2.00. 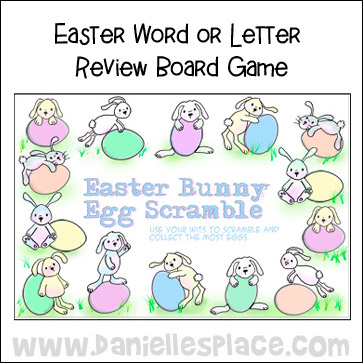 It includes a pattern of 18 colorful eggs, and three sheets of Compound Words to play the Scrambled Eggs game. Foods - buttercup,	sweetheart,	butternut, cheesecake,	tablespoon,	shortbread, gum ball,	jellyfish, and	egghead. Body - bodyguard,	sideburns,	handbook, headline,	footrest, brainwash, eyelash,	backslide,	and skintight. Animals - watchdog, grasshopper,	bluefish, butterflies,	horseback,	honeybee, earthworm,	snakeskin,	and	blackbird. 1. Fold an 8 1/2" x 8 1/2" piece of paper in half, corner to corner to make a triangle. 6. After you have folded the basket use a hole punch to punch holes on each side of the basket. 7. Braid three pipe cleaners together and then attach them to the basket using the holes. (If you don't want to use pipe cleaners, you can just staple a strip of paper to the basket for the handle. 8. Decorate the basket with tiny spring stickers. 9. Print out the egg patterns onto different colors of paper and cut them out. 1. Letter Recognition - Write the letters of the alphabet on the eggs, one on each egg. Lay the eggs out on a table, face up. Have your child pick an egg and tell you what letter is written on it. If he is correct, he gets to place it in the basket. If he is wrong or doesn't know the letter, tell him the letter and place it in a pile. When your child has gone through all the eggs. Place the eggs that were in the pile on the table and keep playing until all the eggs are in the basket. 2. Number Recognition - Play the same as above, but use numbers. 3. Matching Numbers or Letters - Write letters or numbers on the eggs and make matching eggs. Place all the eggs on a table, face down. Play match game. When a match is found the eggs should be placed in the player's basket. The player with the most eggs win. 5. Create Color Patterns - Have your child place the eggs in rows using different patterns. For example, he may use red, green, blue, red, green blue. 6. Counting - Have your child count how many eggs he has in his basket. Count by twos, threes, fours, etc. 1. Vocabulary Words - Write your child's vocabulary words on the eggs, one per egg. Place the finished eggs on a table, face up. Have your child pick an egg and read the word written on the egg. If he can read the word, he gets to place it in the basket. If he can't read the word, tell him what the word is and then place it in a separate pile. 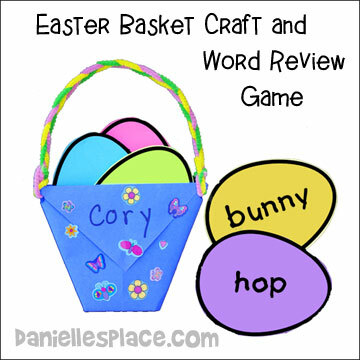 When he has gone through all the words, place the eggs from the pile face up on the table and have him pick words he knows, and place them in the basket. Keep playing this way until all the words are in the basket. 2. Vocabulary Word Match - Write your child's vocabulary words on the paper eggs making matching sets. Place all the eggs on the table face down. Play match game trying to turn over two matching eggs. If a match is found, the player places the eggs in his basket. The player with the most eggs wins. 3. Spelling Eggs - Write your child's spelling words on the eggs and place them all face down on a table. Have him point to one of the eggs. 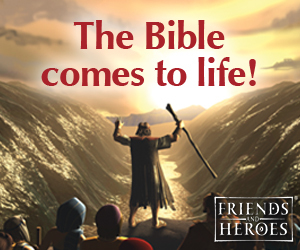 Turn over the egg and read the word to your child. If he can spell the word, he gets to place it in his basket, if not, the egg goes back down on the table and is mixed in with the rest. Keep playing until all the eggs are in the basket. 4. Reading/Writing Game - Each player thinks of a sentence and then writes it, one word per egg, on the eggs, and then mixes up all the eggs and gives them to another player. Players then have to put the eggs in order to make a sentence. When a player is done, he should ask the person he got the eggs from if he is correct. If he is correct, he should trade his eggs for another set of eggs. 5. Review Math Facts - Write your child's math facts on the eggs. Write the problem on one side and the solution on the other. Turn all the cards over so that the problem side is up. Have your child pick an egg and tell the answer. If he is right, he gets to place the egg in the basket. If he is wrong, tell him the answer and place the egg in a pile. When he has tried all the eggs, place the eggs that he missed on the table and keep playing until all the eggs are in the basket. 7. Read "Happy Easter, Mouse! " by Laura Numeroff - Have your children count how many eggs Mouse found, and then have them count how many eggs are in their baskets. 8. New Easter Words - Have children write words from the story on their eggs that they didn't know before reading the story. If they knew all the words, have them write new words relating to Easter. These cute little bunnies can be made for real eggs or plastic eggs filled with treats. They can also be used as place settings for your Easter Feast. 1. Prepare your eggs ahead of time. Color them if you are using real eggs, or fill them with treats if you are using plastic eggs. 2. 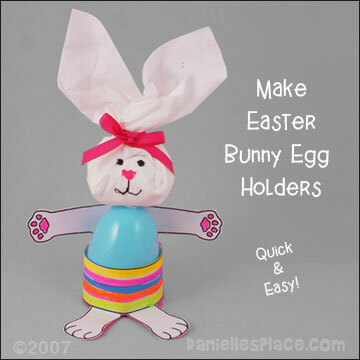 Print out the easter egg holder patterns, color them and cut them out. 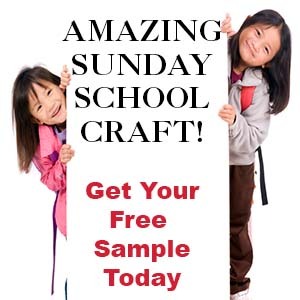 (A pattern for this craft is available to members only.) Tape the egg holder feet pattern around the egg you are using and tape into a circle. Place the egg in the holder and them place the hand and torso pattern behind the egg and inside the egg holder pattern. 3. To make the bunny heads you will need two facial tissues for each head. Crinkle up one facial tissue into a tight ball. Unfold another tissue and flatten it out on a table in front of you with one corner closest to you. 4. Place the crinkled up tissue on the corner of the tissue that is closest to you. Starting at the corner closest to you roll up the tissue inclosing the wadded tissue. 5. Draw eyes and ears on the face and glue it onto the smaller end of the egg. 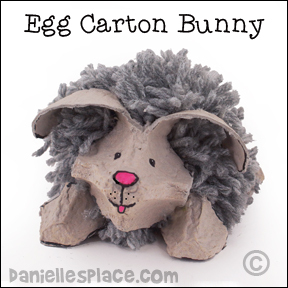 Don't throw away those old egg cartons this Easter. 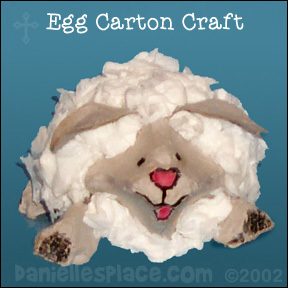 You can make this cute little sheep with just a Styrofoam egg and some tissues. Egg Carton, Use a egg carton that doesn't have long pointy dividers between the eggs. Find one that is more flat like the one shown in the picture, 3" x 2 1/2"
1. 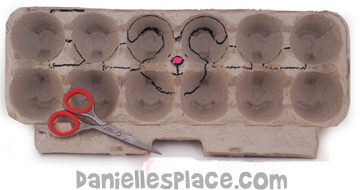 Mark out the pattern inside the egg carton with a pencil as shown in the picture. The shapes on each side of the head are the feet. Draw four of these. Cut them out. Glue the head onto the smaller end of the Styrofoam egg. Glue the legs onto the egg also. (You may want an adult to glue on the legs with a hot melt glue gun. 2. Draw a face and fold down the ears. 3. Rip small pieces of tissues and crinkle it up into little balls. Glue them all around the sheep's body. Don't throw away those old egg cartons this Easter. You can make this cute little bunny by adding some yarn. Paint if You Would Like to Make Your Bunny a Different Color. 1. Mark out the pattern inside the egg carton with a pencil as shown in the picture. The shapes on each side of the head are the feet. Draw four of these. Cut them out. 2. Use a 4-inch pompom maker to make the gray pompom for the body. 3. Trim the pompom to fit the head. Glue the head to the pompom. Glue the front legs onto the head and the back legs to the pompom in the back. You can also use a tiny pompom for the bunny's tail. 4. Draw a face and fold down the ears. 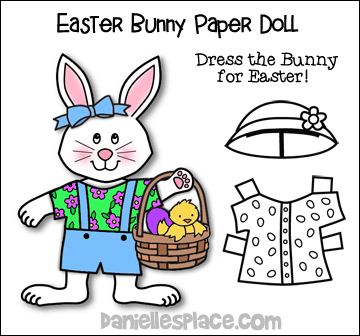 The Easter bunny paper doll comes with two outfits, a bow, an Easter hat, and an Easter basket. Also included is a blank pattern so children can design their own outfit. 1. Print out the bunny paper doll onto card stock, color the bunny, and cut it out. 2. Print out the clothes patterns onto computer paper, color them, and cut them out.